Resumes have undergone a digital transformation. In a more competitive job market than ever, skills alone are not sufficient to gain employment with top companies. In the art of contemporary resume writing, it is now a numbers game. The most successful resumes that work in landing candidates jobs are quantified. Resumes have to be quantified in order to be considered qualifiable for many of today’s positions. In this article, the Simple Resume team will give you tips and basic resume examples demonstrating how to quantify your simple resume for your 2019 career goals. If you worked in a team environment, it can be extremely helpful to use numbers to detail how many people were on your team, how many people worked on specific projects, and how many people you led or managed. If you handled specific tasks often, it is great to mention how frequently you were required to accomplish these specific tasks. Showing frequency of tasks or projects in your job resume helps employers get a better picture of your consistency, proficiency, and willingness to repeat necessary tasks. 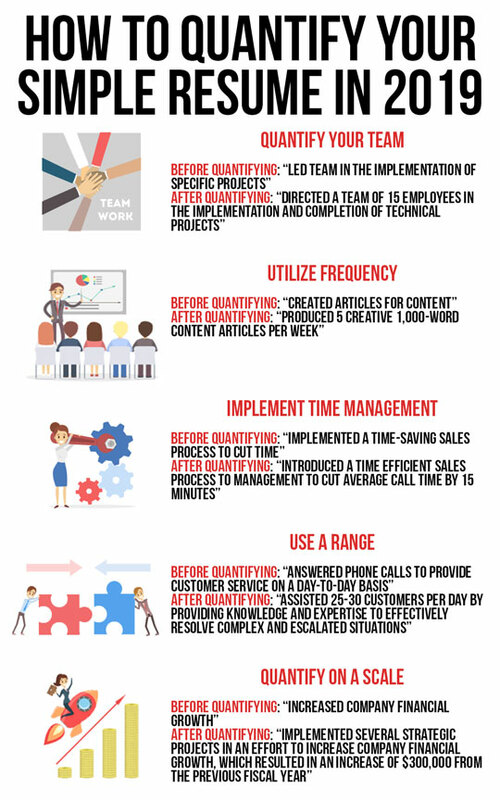 The following is one of our basic resume examples of how to quantify your frequency of performing specific tasks. Time is everything. In the professional world, you must be able to do everything in a timely fashion. Save time, manage time, complete tasks, and meet deadlines are a few things that require good time management. Here’s one of our many simple resume examples of quantifying time management within your simplified resume. Some job seekers may work in environments where there is really no room for accomplishments and it is really difficult to quantify their job responsibilities. In this instance, it may be challenging to come up with an exact numerical figure. To combat this, use a range in your quantification. Look at the following example for clarification on how to use range to help quantify your work resume. In roles that involve money, it is important to provide a numerical scale of a company’s financial growth, allocated funds, and costs. The following is one of our simple resume examples on how to quantify your financial accomplishments on a scale. Quantifying your simple resume creates a resume built for optimal performance. Our certified Simple Resume writers are trained to quantify your accomplishments and can create an effective, brand new resume for a low cost.